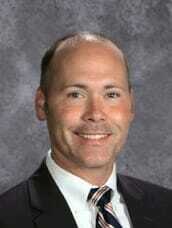 On March 1, 2012, I was introduced as the new Principal of Quincy Notre Dame. The memories of that day will last a lifetime. One of many special moments, however, was realizing that I was the first alumnus to serve as Principal of Quincy Notre Dame. What an honor! My wife, Jamie, and I both graduated from Notre Dame in 1995. We have been blessed with three children: Connor, Lauren, and Emma. They currently attend Blessed Sacrament Catholic School. As parents, we know and value education. We want our children to experience all the benefits of a Catholic institution. Notre Dame was not only our school, but it was our “home away from home.” The staff knew us personally and we felt as though we were part of something special. As you know, Raider Pride is a mentality not just a phrase. It describes a way of life, one based on faith, family, and a commitment to excellence. Over that last several years, social media has revolutionized our ability to stay in touch with our alumni. Please continue to remain engaged in and involved with your alma mater. We need your support now more than ever. We welcome your comments, suggestions, and questions. If at any time we can be of assistance to you please let us know. You are always welcome (and encouraged) to visit us on campus. Come back to see your school in action. While our mission has remained the same, we have many new faces, some new spaces, and a great deal of information to share with you.